Positive Impact New York, Inc. hosted its 4th annual Blackboards & Backboards StudentAthlete Academy at Brighter Choice Middle School for Boys. Positive Impact New York, Inc. created “The Capital District Classic” to give Capital Region student-athletes a platform to showcase their talents. This year 40 of the area’s top middle school basketball players participated in this annual event that promises to be around for years to come. The campers were treated to workshops on various topics such as NCAA guidelines, positive energy, goal setting, strength & conditioning, the recruiting process and speed and agility in addition to a rigorous basketball workout and games. The purpose of the program is to encourage participation in sports, as a way of encouraging and advancing excellence in academics. The camp offers a valuable opportunity designed to prepare players for competition and life at the next level with an emphasis on character, education, and skill development. 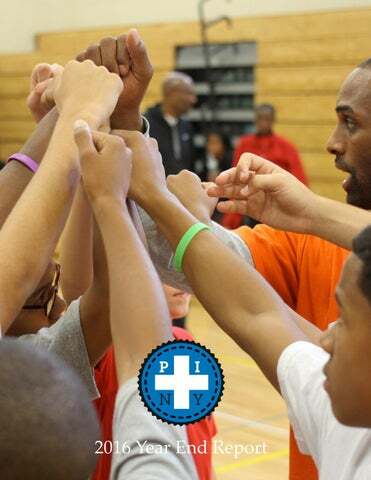 Positive Impact New York hopes that “The Capital District Classic” will ignite the energy and passion of youth basketball in the Capital Region and bridge the gap between the Capital Region’s basketball legacy and the current youth basketball experience while providing an improved platform for competition and exposure. Thanks to all who supported this year’s Capital District Classic. MINI BLACKBOARDS & BACKBOARDS Mini-Blackboards & Backboards is the most unique basketball camp in the Capital Region! This camp is for elementary school studentathletes who are serious about taking their game to the next level. The intent of the Mini-Blackboards & Backboards Student-Athlete Academy is to provide players with an elite environment to demonstrate and improve upon their individual skill level. This unparalleled atmosphere will render a true reflection of where your skill level is. compared to your peers. Additionally, campers will be given an informed and honest assessment of their game in order to foster an awareness of the aspects they must continue to improve upon to remain among the best, while accomplishing their goals within the sport. MIDDLE SCHOOL MADNESS Positive Impact New York, Inc. hosted its inaugural Middle School Madness at Union College. Middle School Madness was comprised of 100 student-athletes from throughout the Capital Region chosen by Executive Director Terrell Dozier and his staff. The Middle School Madness will be the premier elementary/middle school all-star basketball event in the Capital Region! Positive Impact New York, Inc. created “The Middle School Madness” to give Capital Region student-athletes a platform to showcase their talents. Positive Impact New York, Inc.